Learn how top companies solve the problem of leadership succession from corporate America's leading consultant. A serious crisis looms in American management today. More and more CEOs are failing; there remains an acute shortage of capable replacements. The true dilemma in leadership is the stagnant state of corporate leadership development. Because companies fail to hone their unit managers' leadership abilities, they are never able to fill their succession pipelines. With unit managers stagnating, companies have difficulty executing at every level, compounding the crisis. 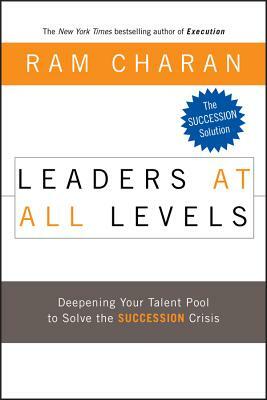 In I>Leaders at All Levels, bestselling author Ram Charan shows how top companies approach leadership development as a core competency, recognizing that an adaptable leadership pool is a competitive advantage, and focusing their attention on bringing out the best in the leaders they have. Charan reveals exactly what's wrong with corporate leadership development and tells how to make it right. He explains the concept of a leadership "gene pool" and shows how companies can discover just what "DNA" they need to succeed. He also details how to uncover the hidden leaders in a company, when and where to bring in fresh talent, how to coach, measure, and reward leadership, and much more. For CEOs, directors, and anyone involved in leadership development, Leaders at All Levels is an eye-opening guide on how to get succession right. The Author RAM CHARAN is a world-renowned advisor to business leaders and corporate boards, a bestselling author, and an award-winning teacher. He is the author or coauthor of fourteen books including Know-How, What the CEO Wants You to Know, Boards that Deliver, and the New York Times best-seller Execution.